Have you desired straighter and whiter teeth? Perhaps Invisalign is right for you! Have you desired straighter and whiter teeth (without metal braces)? Perhaps Invisalign is right for you! As effective as braces without the wires or pain! Who doesn't want straight teeth and an attractive smile? Until now the alternatives were crowns, conventional veneers (where the natural tooth is still ground on and prepared), or metallic braces with wires. → Healthier Gums - Properly positioned teeth are easier to brush and floss than teeth that are crowded, crooked or spaced too far apart. → Easier Cleanings - With maintenance of good oral hygiene, the chances of having plaque retention, tooth decay, and periodontal (gum) disease can be reduced. → Improved Chewing and Speech - In some instances, speech problems may result from poorly positioned teeth and jaws. → Correction of the bite - Can help improve chewing and speech. → Decreased Risk of Dental Trauma and Abnormal Wear - Properly aligned teeth are less stressful on the supporting bone and jaw joints. → More Beautiful Smiles - Straightening your teeth with Invisalign will allow you to enjoy the smile you have always dreamed of. Invisalign is Invisible, Comfortable, and Removable! Undetectable - The clear aligners are virtually invisible to others. Removable - The aligners are removable for eating, brushing and flossing. 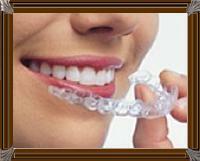 Comfortable - The aligners are comfortable to wear, since there are no brackets, wires or permanent fixtures. If you have any questions, please Click Here to Contact us!